*What a great week we have had for walking in the morning. 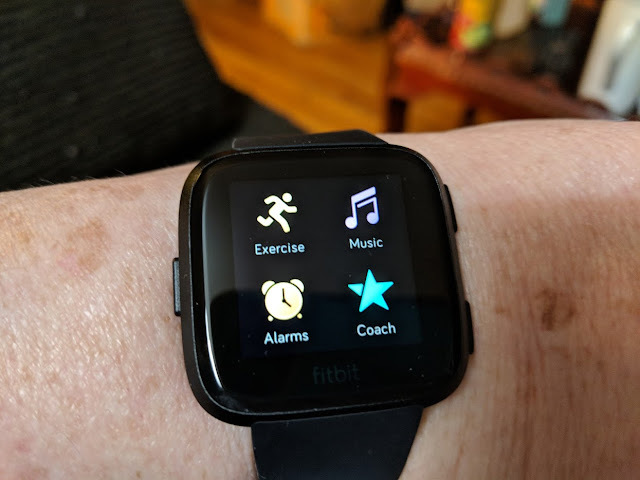 On Sunday, I received the new Fitbit Versa for Mother’s Day. I have been playing around with it this week. I now can receive notifications on this device when I get emails, texts and phone calls. It tells me when I need to move a little more to get the 250 steps each hour that they recommend. I always know what my heart rate is, how many total steps I have taken throughout the day, how many flights of stairs I have climbed, and the time and date. There are features that can be used by pairing Bluetooth headphones. These arrived today. I spent some time trying to sync a music program so I can listen to music from my fitbit. It didn’t quite work. I shall work on it more at a later time. But I am loving this new device. I have accomplished my goal so far this month of of getting to at least 10,000 steps each day. *My weight loss journey continues to be successful. Thursday is weigh in day, and, since March 1, I have lost 27 pounds and 30 inches. And it sure helps when people encourage you and tell you how good you look. But what I like that I am hearing isn’t just about the loss of weight and inches, but people say I look healthier. That, to me, is much more important. Because that is what I want to be. More healthy. *I got a Composition Notebook to write out information about my outside gardens to keep me more organized this summer. I wrote down what seeds I have planted and when. I wrote down what kind of tomato plants I have purchased, and the ingredients I need to plant them. I need to pick up a few more items when we go to CDA tomorrow. *Our blender quit working, so Macys had a great deal on a new blender, so I ordered a new one, along with some new walking shoes. I tried out the new blender by making some “bulletproof coffee”. My recipe calls for a scoop of MCT Oil Powder, 2 Tbls. Heavy Whipping Cream, 1 Tbls. Kerrygold butter, 1 tsp. dark cocoa powder, and 16 ounces hot coffee. It is all blended together until it is nice and frothy. It is very delicious.